Our Save the Primates campaign has exposed laboratories, monkey dealers and trappers and helped shape far reaching proposals for EU legislation, as we have taken the campaign across the world. During the campaign for a ban on the use of primates in the EU, three laboratory monkeys were handed into our care. Now safe in our quarantine unit, the three very lucky monkeys, Baloo, Bacil, and Bacilusk, will be released into a large outdoor enclosure this summer as the European Parliament finally decides on the fate of other monkeys just like these. On an icy, cold winter’s morning we waited for the monkeys at Stockholm airport. Months of negotiation and preparation had led up to this point, and as our breath hung as mist in the wintry air, we wondered “What if they have changed their minds?” It was approaching 6am in the almost deserted cargo section of the airport when the animal van from the laboratory rumbled into sight – they had been categorical that we could not enter the lab to collect the animals nor see them loaded. The van stopped and the rear doors were opened. Campaigns Director Tim Phillips and Supporter Relations Director Lisa Mitchinson clicked on their torches and peered into the crates to check each monkey. Bright eyed, alert, but looking fairly relaxed, three small macaque monkey faces looked back at them. They had no idea that their lives had changed forever. Each year 10,000 monkeys die in European laboratories. Animals that make it out alive are very rare indeed. Calls to free animals usually fall on deaf ears, even for animals used in non-invasive experiments. Labs have little incentive to give a living face to the animals they use and ultimately kill. However on this occasion, the laboratory listened to public pressure. These monkeys are the embodiment of the issues that have provoked fierce debate across Europe for the past few years over ending the trade in what are known as “F1” monkeys. Almost all laboratory monkeys are born of wild caught parents and are known as “F1” (first generation of one or both wild caught parents). Thus, whilst laboratories claim not to use wild caught monkeys, the dealers supplying them are in fact constantly capturing animals from the wild to re-stock their factory-style breeding farms. It is a trade we have campaigned hard to halt and thrown our hearts and souls into an intensive five years. The European Commission responded with proposals to prohibit the use of F1 monkeys in five years. But when the proposals went before the European Parliament last year, the animal experimentation industry mobilised an army of lobbyists to undermine them. A huge response from ADI ensured that the proposals weren’t torn up altogether and this year we should take a step closer to ending this cynical trade. Less than we had hoped for but some progress. The parents of Baloo, Bacil and Bacilusk were torn from the wild in Mauritius, packed into crates and sent to Mazor Farm just outside Tel Aviv, Israel. Here a series of monkey sheds is enclosed by a high fence. Sounds of monkeys calling out cut through the air. In late 2001 Baloo, Bacil, Bacillusk and another monkey, Bamse, were born – about a month apart. They have been described as “half-siblings”. As each approached their second birthday they were sold to a Swedish laboratory. On 7th October 2003, they were packed in crates and flown to Holland and then taken by road to the laboratory. Here they were trained to present their arms for injections and withdrawal of blood and to open their mouths for examination. They were used in neurology experiments involving PET and MR imaging, and given trace doses of substances with “minimal effect on behaviour”. It is a chilling irony that these imaging techniques that now enable a huge spectrum of neurology research on human volunteers have, in some facilities, have been used on animals instead of replacing animal use. Bamse developed diabetes and was killed. By 2009, the monkeys were no longer needed in the neurology tests, although they continued to be used for supplies of blood for other experiments. Swedish animal rights group Djurrattsalliansen had followed the story of the monkeys since they learned of the import six years earlier, and supporters began a letter writing campaign urging the laboratory to spare the animals. Djurrattsalliansen and Israel’s Behind Closed Doors group contacted ADI and asked if we could persuade the laboratory to hand over the monkeys. We immediately contacted the laboratory and asked if they would hand over the monkeys if we could provide a suitable home. The laboratory responded positively, provided they could inspect the facility! And so began an ADI partnership with Lakeview, a wonderful monkey sanctuary in Ascot, Berkshire that specializes in caring for abandoned macaque monkeys. As is our policy with animal rescues, ADI will be funding the care of the monkeys for the rest of their lives: this includes construction and upkeep of the enclosures, food and nutrition, and veterinary services. We will therefore be urging all our supporters to please help and donate to ADI for the care of these monkeys. We met representatives of the laboratory at Lakeview and agreed the handover of Baloo, Bacil and Bacilusk. But time was now ticking and we were given until Christmas to move them. However, there was a space problem at Lakeview! 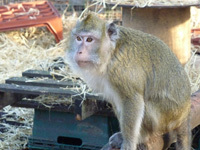 A pair of monkeys, rescued from the pet trade, were due to leave the quarantine unit. So to speed up the process we committed to funding a new outdoor enclosure for them. Staff from ADI rolled up their sleeves and used their time off to go and help build it. Defra (Department of Environment Food & Rural Affairs) then inspected the quarantine and we were ready to go. At the same time, we made travel arrangements and organised construction of a special travel crate, with three sections with small, metal mesh windows to enable the monkeys to see each other. We then sent the crate to the laboratory, and the next time we saw it was at the airport with the monkeys inside. In what might be described as a remarkable Christmas truce, ADI, the group that has led the campaign to end experiments on primates in Europe was handed some lucky little monkeys by a European laboratory on a wintry December morning. The crate of monkeys was lifted onto the aircraft before the ADI team boarded and just a few hours later loaded into a quarantine van and driven to Lakeview. Each crate was opened and out sprang a little monkey. All three were alert and very calm and immediately set about exploring their new home. On Christmas Day, Lakeview directors Jim and Sharon wrapped treats for all the monkeys in the sanctuary, and so Baloo, Bacil and Bacilusk (currently known as the 3Bs until they get new names) excitedly unwrapped their gifts and devoured the contents – images of which ran in Israel’s media. As a poignant reminder of how lucky the 3Bs are, whilst we were working to secure their release, 50 monkeys were killed at the same facility in experiments, 33 new monkeys were imported, and at the time of going to press, 49 monkeys remain there. On January 3rd after acclimatisation in the indoor section of the unit, the monkeys were given access to two adjoining outdoor quarantine enclosures. The door was opened and Baloo (our cover star) headed down the tunnel to explore the enclosure closely followed by Bacil and Bacilusk. With great excitement they explored; hearing the calls of the other Lakeview monkeys, Baloo climbed as high as he could and peered out towards them, calling back. What do we know of their conversation? We know from our undercover investigation of HLS how a deathly hush would fall over the laboratory when monkeys were killed, as all the animals sensed what was happening. Here Baloo must have sensed something very different from his previous life in the lab. At just 8 years old, Baloo, Bacil and Bacilusk, could live to the age of 30, and so have the prospect of many happy years in a large natural enclosure funded completely by ADI – work will begin on construction in the coming weeks. At Lakeview they will have expert care in a tranquil woodland setting, which will be as close to ‘home’ as we can provide. Against all the odds, three little monkeys have a future and will grow old in peace and safety. Our thanks to PBS International for its help in organising the transportation of the monkeys, and to Djurrattsalliansen and Behind Closed Doors, who alerted ADI and trusted us to save these monkeys. Please remember that these monkeys are alive today thanks to letter writing and your support. We urgently need donations towards the completion of the ADI enclosure at Lakeview that will be the monkeys’ home after quarantine. We also need supporters to adopt these monkeys and ensure their ongoing care for the rest of their lives.